Discussion in 'First Time & New Camper Owners' started by Nugz, Mar 7, 2019. Hey all, I have a 2013 Starcraft Comet 1020 Electric lift PUP. I cannot open it all the way because of my garage door opener, is it ok to temporarily open it half way to put a few items away and then close it back up? Don't want to add extra stresses to the cables or structure. As long as you are level when you raise it, you should be fine. I do it all the time without any problems, fear not! Back when we owned our Santa Fe I'd regularly raise the roof a bit in my workshop so I could pull out the tenting to allow it to dry. No issues at all. Jonson01 and Garrity like this. You should have no problems. 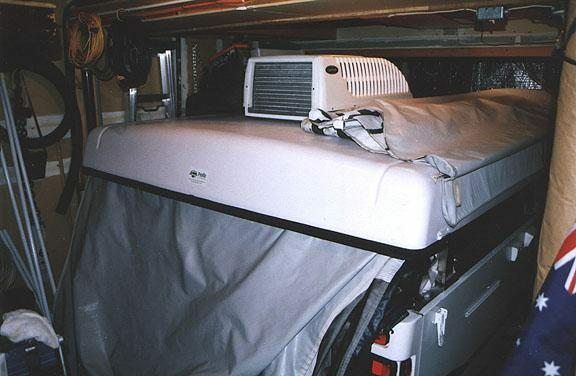 I had an old Jayco with a manual lift that got left partially up for over a week in the garage to dry the canvas and mattress after a particularly bad storm during close up on a camping trip with no lasting problems. The hard thing for us was getting the bunk ends out as we had no room in the back and if it was raining no room in the front to maneuver inside the pup. Making sure the camper is level before lifting though. I have had both my old 10 foot PUP and my new (to me) 14 foot high wall fully open in my garage. The trick is you have to be able to push and rotate it sideways across the back end of the garage so that it's behind the garage door opener and tracks. Also you have to crouch under the bunk end to get in the house! We do this when cleaning it out for the spring or fall or to do a repair. Our HOA doesn't allow rvs, boats, or trailers parked in the driveway more than 48 hours. I did it all the time with mine. Our HOA doesn't allow rvs, boats, or trailers parked in the driveway more than 48 hours. My township doesn't allow more than 24 hours. I always wonder if that means I'd be in the clear if I moved it inside for just an hour, and reset the clock. I'm actually looking into a high lift conversion, which will put my garage door at just shy of 10 feet, when open. This should let me open the pup in the winter, but more importantly, move the track up so that I can build some garage cabinets with doors that will be able to open without hitting the track! When a pup takes half your garage, organization of everything else becomes paramount. I'm hoping to have enough garage space cleared to give the Starflyer a dry storage space in a couple weeks (it has a cover now). I don't think I'd have enough space to get the top up with the garage door up, but if I position it just right I think the A/C will slip between the rafters. I recently got a new door & opener. I replaced the opener with a lift master that has the motor mounted to the door itself. No over head track. I can now fully open my pup. Best thing ever. You're half-way to the high-lift conversion I mentioned above, which will put the rails pretty much right on the ceiling. So in addition to no rail for the opener, your door rails are way out of the way, too. My parents got those shaft drive openers when they renovated their garage a couple years ago. The combination of the shaft drive and the rails going right to a 12 foot ceiling is a hard setup to beat. Whoo hoo! My new door is installed with the jackshaft opener and the 36" radius track. The door now hugs the ceiling, and the garage feels spacious. I really want to open the pup, but I have a lot of timber on its roof right now that I need to build some storage for. Shouldn't be a problem. At times I will open it up about halfway in the garage when I need to get into it or let it dry. The garage door opener sits about 10" below the ceiling joists so I couldn't open it up all the way anyway.